Fair Wayfinding. A small sign out by the road, but the church itself is hard to miss at the end of a suburban office drive. The architecture of the church funnels visitors to the center of the church and then into two lines. One for dine-in, one for take-out. Ordering was very slow, as most churches utilize a slip of paper ordering system, here there is only a small window where you order and they serve your food. No menu when you finally get to ordering. You pay after you get your food. Plastic plates and silverware. Condiments in re-fillable plastic cups. 1-lb fish option served in cardboard bowls. Still no signage to speak of. No menu until you get right up to the payment counter. We wanted bulk fish, so we went through the take out line instead of the dine-in line. Recycling receptacles were visible throughout the cafeteria, but alot of styrofoam. Our review from 2009 said that bulk fish was served in cardboard bowls, but we didn't notice the bowls this time, just styrofoam containers. Cod was spicy, but a little too salty. Some of that salt could have been used for the fries. Sides were OK - slaw, mac and cheese, onion rings, fries, spaghetti. Nothing spectacular, but not bad either. Opinion hasn't changed too much. Cod was very good, not as salty as I had noted at the 2009 review. Fish could have been a little more moist for personal preference, but overall very good. Nothing from the sides stood out, but they were all done nicely. $7.50 for adult plate with two sides. $4 fish sandwich. 1-lb of fish for $9. $1.50 sides, $1 desserts, $1 lemonade/tea, $2 beer. No kids meal. Good value, especially if you want to eat alot of fish, you can order fish by the pound! We had 6 adults and 6 kids, so the bulk pricing was a good deal for us. Without drinks and dessert, it was under $70 for the 12 of us. $11 lb for fish. Desserts and drinks were still $1 each. The only downside was getting water was not easy. Usually we try to avoid negative comments, but my wife asked for a cup for water, and only with reluctance was a cup given for "free" water. A tale of two sides. There were two rooms for dine-in and carry-out, both had seating. The dine-in side was a new cafeteria, but rather vanilla. The carry-out side had round tables, architectural light fixtures, and more color - so sit on the carry-out side. Locals seemed used to the long line and stood in line with drinks. About 30 minute wait by 5:30. The "dine-out" side is definitely the better side for atmosphere. Nice round tables, stain glass walls, architectural lighting - and a pleasant buzz of conversation. 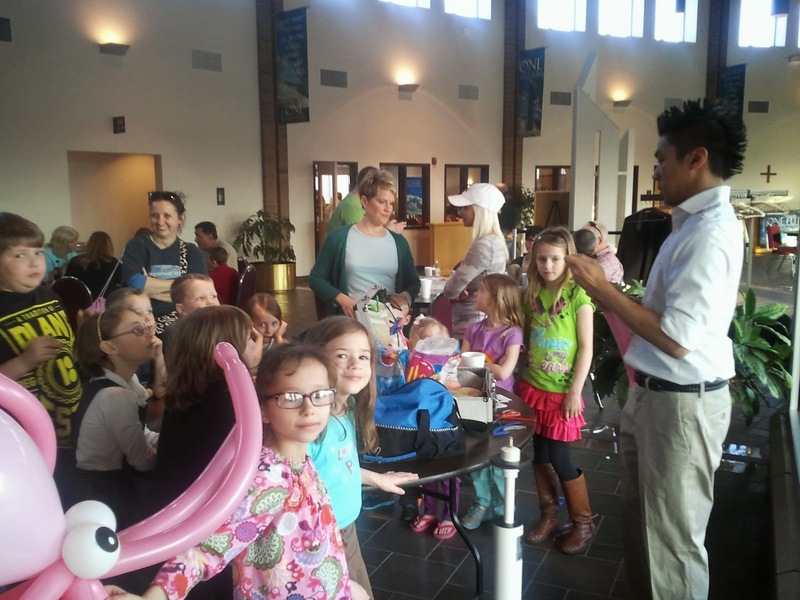 A highlight this year was a balloon artist for the kids. 2.5 out of 4. 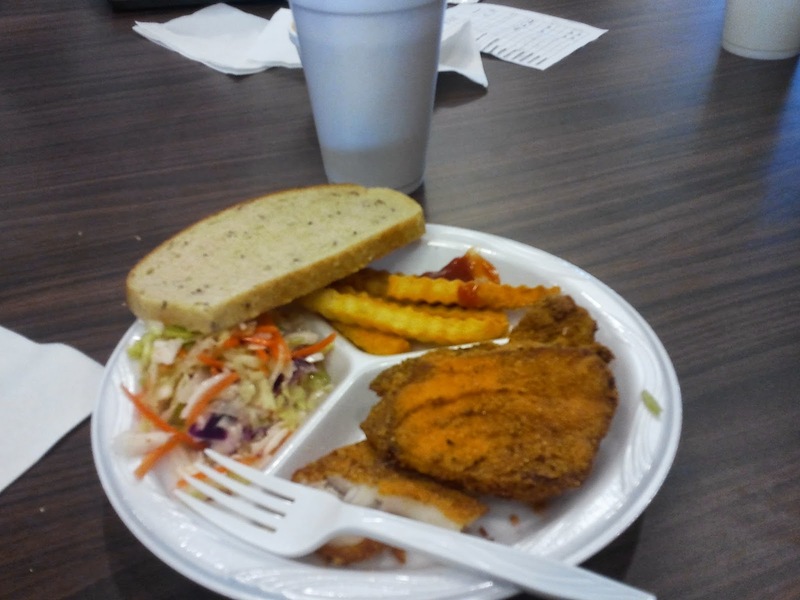 A good, solid, community fish fry. A good sense of community and the church was hopping with various activities. It was neat to see one of the newer churches in the area. Probably not worth a special trip just for the fish fry, but St. Clair Square is just down the road if you needed to combine a trip to the mall and a fish fry. 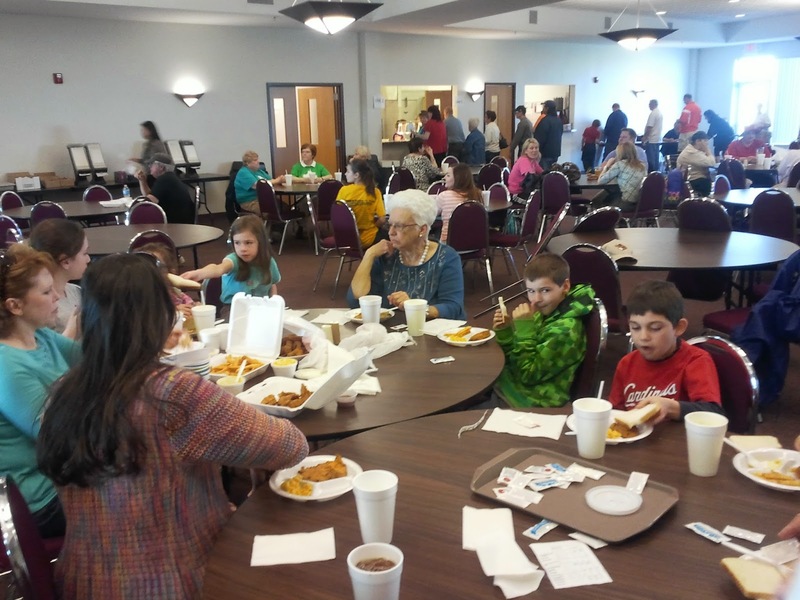 Holy Trinity is a good fish fry for a large group. We had six adults and six kids, so we were able to push together two tables to easily fit all of us. The ability to buy fish and sides in bulk also is a nice plus for a large group. 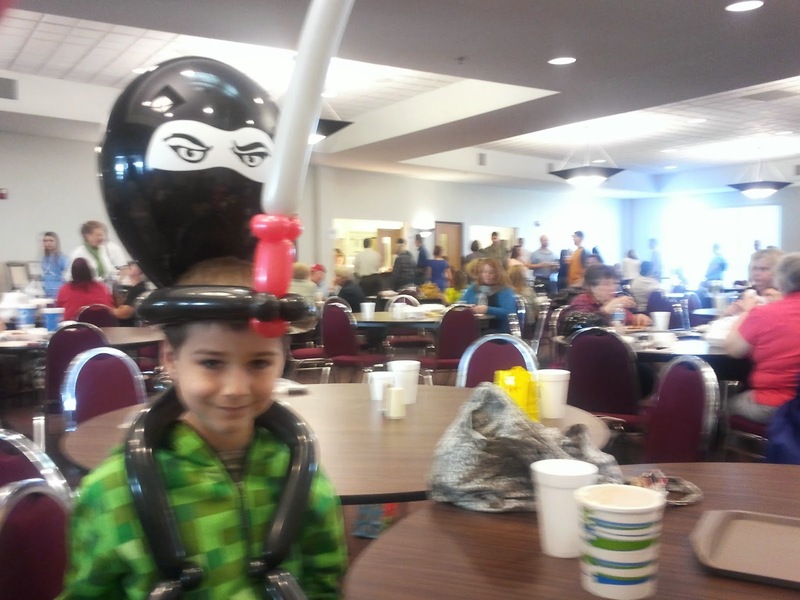 A bonus this year was a balloon artist for the kids - and not just the ordinary poodle or sword balloons, but multi-balloon pieces like an octopus and ninjas - pretty cool! We ranked this as a 2.5 in 2009, but really is more like a 3. Good atmosphere and good Cod!